Have this simple and elegant Indian traditional blue color party wear for kids from AJ DEZINES. Made from silk blend fabric and comfortable wear and the fit is regular for boys clothing. Waistcoat has nehru collar, button detailing, pocket square detailing, welt procket and this is handmade and embroidered with the thread work and Sequence work. 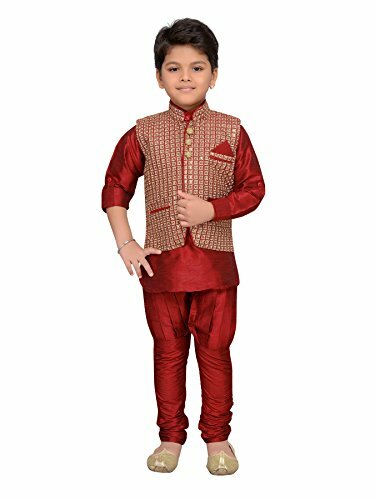 This fashionable ethnic wear is perfect to dress your kids for weddings, parties, festivals, ceremony. This product is available in different color Blue, Peach and Maroon. Dress up your adorable one with this outfit along with mojadis for a complete traditional look. We are a leading Brand in kids wear with wide range of kids clothing which includes kids ethnic wear, casual wear, accessories and a lot more. Size: The suit set size and measurements might be different from other clothes children normally wear. For best fitting, please take measurements for your child and refer to size chart in last picture before purchase. Feel free to contact us by email if you have any question about size. If you have any questions about this product by AJ Dezines, contact us by completing and submitting the form below. If you are looking for a specif part number, please include it with your message.